Marrakech, 22 March 2019 (ECA) – Delegates attending the 38th meeting of the Committee of Experts of the ECA Conference of African Ministers of Finance, Planning and Economic Development have applauded the Federal Republic of Ethiopia for having just ratified the instruments instituting the African Continental Free Trade Area (AfCFTA), in a plenary debate in which the AfCFTA was given prime focus. News that Ethiopia's House of People's Representative had become the 21 st legislative body to ratify the agreement on the AfCFTA on the 1 st anniversary of the signing of the agreement by many African countries in Kigali – Rwanda (this occurred on 21 st March 2018), met the experts in a very charged review of the performance of ECA for the period running from April 2018 to March 2019. The action of the Ethiopian parliament, now leaves room for just one more country to ratify the AfCFTA for it to become operational. Coincidentally, the support ECA gave to the African Union and member states in formulating, negotiating for, and adhering to the agreement, was widely accepted as one of the Commission's major achievements in the period under review. After keenly following a report by ECA's Executive Secretary on the activities of the Commission since its 51 st session in Addis Ababa last year, representatives from several countries enjoined ECA to accompany their countries to fully appropriate the continental trade arrangement so as to benefit from it. Mr. Stephen Karingi, Director of the Regional Integration and Trade Division and Ms. Eskedar Nega, Chief of Evaluation at ECA, assured the delegates that the Commission was already accompanying 15 countries in drawing up their AfCFTA strategies and that this support would be extended to other countries on a request basis. 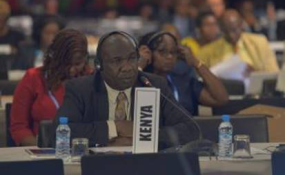 Responding to a query from Ambassador Raj Busgeeth of Mauritius that policy makers of member States were not very versed with the free movement protocol linked to the AfCFTA, Deputy Executive Secretary Giovannie Biha said ECA already had explanatory notes on the protocol on that and other protocols related to the AfCFTA. "The Commission is going to popularize it and make it handy for frontline policy implementers across the continent," she said. "I'm very pleased with and express the gratitude of Mauritius to such comprehensive and lucid work done by ECA," Ambassador Busgeeth, then remarked. Another key point for debate coming out of the Executive Secretary's yearly report to the Committee of Experts was the fundamental role of statistics for development policy, and program formulation and implementation. The Beninese delegation particularly praised ECA for its support of statistics but asked for more in especially in terms comprehensive systems to capture and generate data on GDP. The Chair of the session – Mr. Zouhair Chorfi of Morocco spoke of the need for ECA to carve specific niches for itself in the area of African statistics, citing areas such as balance of payment or finance, in order to be the main point of reference for such areas. ECA was taking keen note on these recommendations, Ms. Biha replied to the Chair of the session, while assuring delegates that the African Center for Statistics (ACS), lodged at the Commission has been leading in the rebasing of statistics on GDP (in response to the observation of the Beninese), and would increase collaboration with member States in that regard. However, "data on the implementation SDGS reside with member countries themselves" and they should increase their efforts on investing more in statistics in general, cautioned Mr. Oliver Chinganya who heads ACS. Mr. Chinganya's observation was also linked to queries around needed support to member States on implementing the UN's Agenda 2030 for sustainable development and the AU's Agenda 2063. In this light, the Head of ECA's Macroeconomics and Governance Division – Mr. Adam Elhiraika explained that ECA had already developed a practical toolkit to help African governments to align and monitor progress on both Agenda 2030 and Agenda 2063 but that the continent-wide launch of the platform was being postponed to accommodate UN Headquarters demands that all other regions be brought aboard to transform the tool into a global one. Delegates also sought to know what ECA and other UN bodies were doing to reduce duplication of efforts as they supported member States in Africa. In response, Deputy Executive Secretary Ms. Biha acknowledged the overlap that exists in routing development support to member States but placed it within the context of huge country needs and demands to development partners across the board. She said the UN Secretary General's current reform was already tackling the issue of overlapping UN System support at country level, by compartmentalizing and tightly coordinating support. She added that a strategy for coordinating the invention of UN regional bodies was being worked out. Delegates also examined the relevance and effectiveness of ECA's governing structures such as the Conference of Ministers and subregional Intergovernmental Committee of Experts and scrutinized the Commission's program, budget, and deliverables between 2018 and 2020. During the session, a clarion call was made for African member States to pay their arrears toward the running of the United Nations African Institute for Economic Development and Planning (IDEP), overseen by ECA.